The Greenhouse of Abundance: How to Build Your Own Abundance Oasis for Food Self-Sufficiency | "Global Possibilities"
Breaking from the conventions of the Victorian Age, the modernist movement is responsible for some of our most notable achievements. However, its extension into our agricultural practices and resulting exploitation of our natural resources is where we should have drawn the line. Luckily, modernism is dead — but there’s no reason grieve. Instead, it’s time we focus our attention on the next wave of ecological designers who have inherited the job of reshaping the future of truly sustainable agriculture. A daunting task? Absolutely, but with sensitivity towards nature and our delicate place within it, today’s eco-engineers are ushering in a new era of agricultural abundance and food self-sufficiency — and this is your chance to be a part of it, by building your own ‘Greenhouse of Abundance’. Enter the team at Solution Era. Based in Canada, their 2015 breakthrough project The Greenhouse of the Future blended upcycled materials such as used tires and glass bottles with solar energy technology to create an eco-friendly, cost-effective greenhouse capable of growing organic produce in any climate, while also providing a space for people to connect with nature — even during the winter months. “I believe in the creation of noble and ethical abundance. Our design was conceived and engineered to create a micro-climate that can produce an abundant food supply, breaking our dependence on the current food system while using an absolute minimum of energy. But the “eat local” philosophy isn’t the only factor driving the desire for food autonomy. A recent study from Consumer Reports shows that 72% of consumers in the United States are avoiding genetically engineered ingredients when shopping. Since its debut, The Greenhouse of the Future documentary has become a go-to resource on sustainable living, garnered the interest of 12 million online viewers. The technologies and concepts that inspired its design were based on over 40 years of research and development by Michael Reynolds’ Earthship Homes, as well as many scientific studies on passive solar greenhouses. But what appealed to audiences most is that the greenhouse system is inexpensive to build and maintain, and utilizes previously used resources — the epitome of modern off-the-grid living. Ultimately, however, Gendron doesn’t believe in one-size-fits-all eco-solutions. So, determined to make his D.I.Y. approach to sustainability more inclusive, the Solution Era team headed back to the drawing board in 2016. What they came up with is The Greenhouse of Abundance. Their next venture led Francis to join forces with renowned and award-winning engineer Luc Muyldermans. Their mission: create a passive solar greenhouse that is designed to be adjacent to an existing or planned house. The result? The Greenhouse of Abundance. Now, the team at Solutions Era are preparing to run an interactive online course, to teach others how to build and utilize this groundbreaking domestic food production system. The course, beginning February 2017, employs the same principles of permaculture and sustainable energy technologies, minus the use of tires. The course also features an interactive component that will allow participants to receive support from the team while they set up their greenhouse. Design blueprints are also available for those who prefer to delegate the task to local tradespeople. So, for a modest investment, you can take advantage of this unique step-by-step construction guide to building the eco-home of your dreams. The Greenhouse Of Abundance online course, available in English and French, is available for enrollment now. Click here to sign up. 1. All the required information to master the conception and construction of an abundance greenhouse. 2. All of engineer Luc Muyldermans’ secrets for maintaining your greenhouse and producing fresh and local food all year long, with very little work and no heating costs. 3. The tools and knowledge for you to choose the ideal location for your greenhouse or your gardens. 4. Plans and technical details (in both 2D and 3D) for those who would prefer to assign construction to a local tradesperson. 5. Online support so you (or your builder) can ask questions directly to the team, and to Luc himself, as well as connect, discuss and collaborate with other participants in the course. Are you ready food independence? 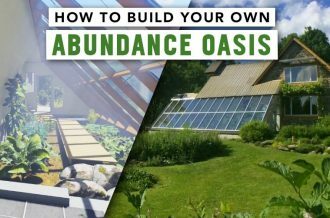 Enroll here for this groundbreaking opportunity, and learn everything you need to know to build your own abundance oasis!